We have many different types of projects throughout the year. This is the perfect getaway mission trip for your youth group, small group, church, or scout group! If you are with Campers on Mission, please click here to register. Fill out the form below if you would like to volunteer! Please call 800-882-7529 if you need more information! If you have been wanting to go on a mission trip, do not have a passport, or do not want to leave the US. This is the mission trip you have been waiting for! Lodging is not included, but we can help you locate motels, or you can bring a camper or a tent. 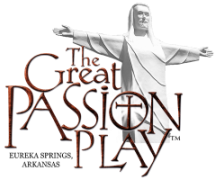 Contact Keith Butler, Chief Administrator of the Play, at 800-882-7529 or email keith@greatpassionplay.com to learn more about volunteer opportunities available at The Great Passion Play. Our 15 RV HOOK UPS are ready to be used! Full/Part time Volunteers may qualify for FREE RV Hook up for the season. Consider being an on-site volunteer!